RCA ARL1-3061. 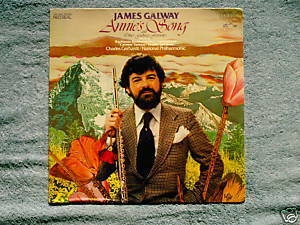 James Galway and the National Philharmonic Orchestra conducted by Charles Gerhardt 1978 LP includes title track, Le Basuq, Liebesfreud, Belfast Hornpipe, "Carmen" Fantasy. Collection of flautist Galway's favorite pieces, ranging from 18th-century Mozart to 20th-century US country. Album produced by Ralph Mace. Sealed LP; cover with photos is VG with creased corner.